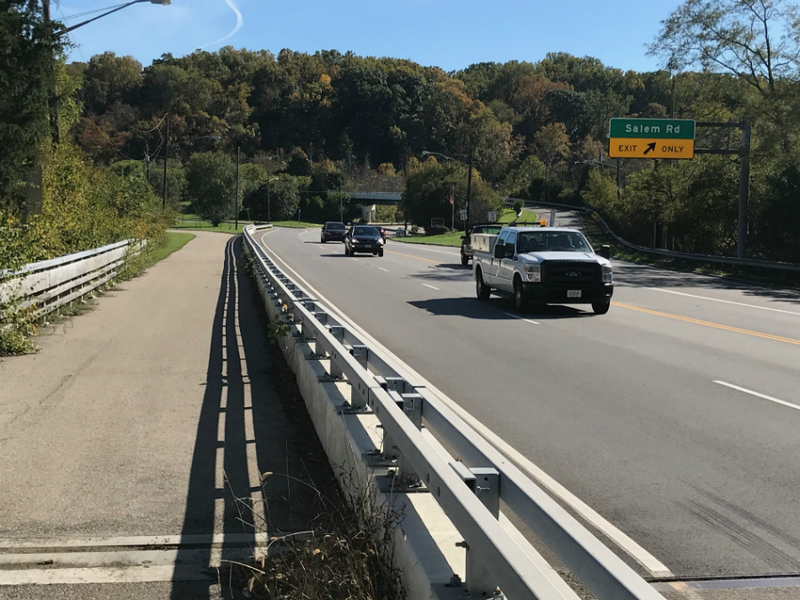 CINCINNATI -- It's been a long and winding road for East Side bike commuters and cyclists moving for a connection between Cincinnati's Ohio River Trail and Anderson Township. That's not a metaphor -- the trail literally winds along Riverside Drive and Kellogg Avenue through East End and out to Salem Road in the city's California neighborhood. But at Salem, the trail abruptly ends, leaving more than a 2-mile disconnect before the trail picks up again in Anderson Township. Now, hopes to connect those two disjointed trails have hit a snag because the city announced it no longer has the money to match a federal grant to complete the project. It's a setback that highlights a growing challenge facing the region's burgeoning demand for more trails and bike infrastructure: As more and more area residents pick up cycling -- either as a hobby or for their commute -- a shortage of money to get these projects moving is becoming more apparent. In other words, the competition among bike projects is getting more and more fierce. It's a good problem to have, said Frank Henson, who heads up Tri-State Trails, a coalition of leaders and advocates working to connect the region's existing trail network and to expand it. Henson has a front-row seat to the competition that arises between these projects. Beyond his work with Tri-State Trails, he is the former president of nonprofit advocacy group Queen City Bike and now serves on the board of directors for Cincinnati's bike share program, Red Bike. "There are so many wants and so many needs," Henson said. "Through dialogue and discussion a priority comes out of that. Then you find the funding to knock it off one by one as money's available." As for the Salem-to-Sutton project, the Ohio-Kentucky-Indiana Regional Council of Governments in 2012 set aside more than $4 million in federal grant money to extend the trail another two miles upriver. The extension would have gone all the way to Sutton Road near the entrance to Coney Island, where Anderson Township's stretch of the Ohio River Trail picks up again. The Ohio River Trail is a plan advocates have spent decades envisioning -- more than 50 miles of trail stretching from southeast Indiana through the city's riverfront and westward into Hamilton County. Momentum is building in support of a plan -- dubbed the "Ohio River Trail West" -- to build 20 miles of riverfront trail connecting Downtown to Shawnee Lookout in North Bend, connecting six West Side neighborhoods. 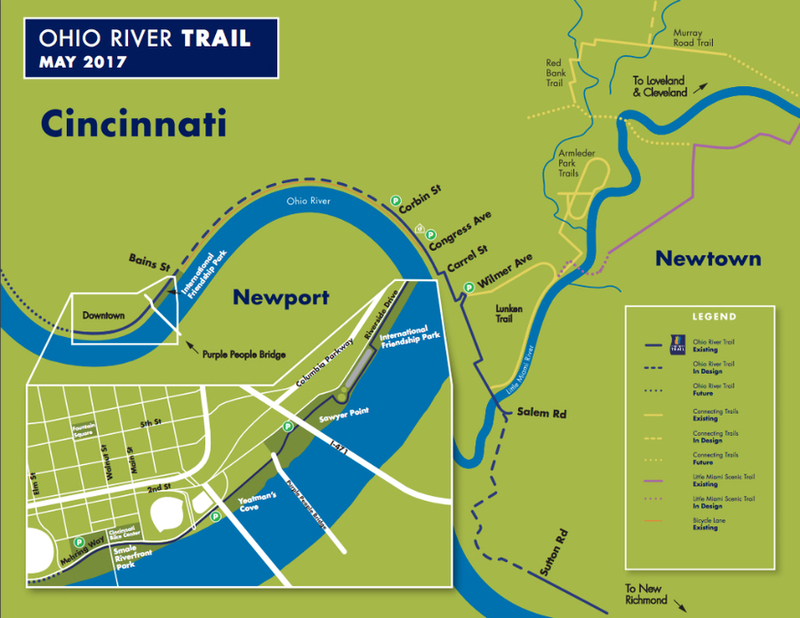 The Ohio River West Trail has secured more than $1 million in money and scored a win by earning a spot on the regional council of governments' 2040 Long Range Plan list. But it also suffered a blow during the 2015 election, when a proposed parks tax levy failed to earn voter support. The Ohio River West Trail was one of 15 projects listed as potential beneficiaries of the tax if it passed. On the East Side, it appears the money is no longer there, either. "The frustrating part is when you think you've come to an agreement, and the funding's there but before construction begins and the money ends up going another way," Henson said. A look at Cincinnati's bike program funding records shows that nearly $1 million originally intended for the Ohio River Trail between Salem and Sutton was rerouted -- to Red Bike, the city's bike share program, launched in 2014. Ultimately, money spent on bikes is money spent on bikes, Henson said. But with bikes becoming increasingly popular among commuters and hobbyists alike, organizations like Henson's have to be more strategic with their advocacy efforts. Seeking and finding consensus is more important now than ever, Henson said. "Usually you'll find (when a project's delayed) people will be disappointed but will eventually understand that another project needs to go first. People will understand if they're patient," he said. Grant application timing also plays a large role in determining what projects to pursue and when. Henson said he believes there might be a few more opportunities to find money before the end of the year, but he did not specify from where. "We'll come back around next year, if we can't find it this year." Henson visited Columbus on Thursday for the Ohio Legislative Trails Caucus, where a group of lawmakers met with trail advocates to discuss strategies for implementing bike-friendly and walkability plans across the state. "The folks in Columbus are trying to get a handle on what it is they can do to promote the development of a robust bicycle trail network in Ohio," Henson said. Thursday's conference was the first in what Henson said he hopes is a long-lasting, statewide conversation. Competition for money extends beyond bike share. 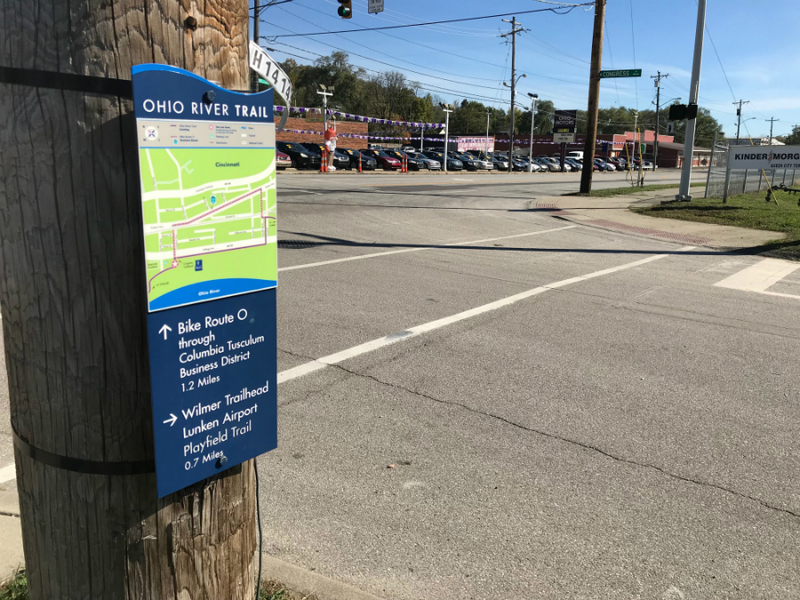 Along with the Ohio River West Trail, the city's Department of Transportation and Engineering has prioritized the Wasson Way mixed-use trail project as a current focus of fundraising efforts. The city purchased the land required to build the 4-mile Wasson trail in 2016, and advocates hope for a groundbreaking soon. City Hall hasn't announced an official groundbreaking date for the Wasson Way trail. In the meantime, it's back to the drawing board for filling the trail gap on Kellogg Avenue. It's a connection Henson called "essential" to encouraging more people to pick up their bikes and ride. "The Salem to Sutton connection is essential along Kellogg," he said. "This would have connected it. It creates an active transportation route from Five Mile (Road) to Lunken Airport." The value a connection from Salem to Sutton offers, Henson said, is making biking more accessible to more people. "We need to find ways to accommodate the interested folks who are never going to be the fearless folks," he said. "This connection would attract those interested folks."